Twilight Recap: After a long night plagued with worry, Bella rises and prepares to attend Forks High School for the first time. Having come from a big-city school in Phoenix, she isn't sure what to expect from the small-town local school, and she worries about how she will adapt to this new environment. Finding the school wasn’t difficult, though I’d never been there before. The school was, like most other things, just off the highway. It was not obvious that it was a school; only the sign, which declared it to be the Forks High School, made me stop. It looked like a collection of matching houses, built with maroon-colored bricks. There were so many trees and shrubs I couldn’t see its size at first. Where was the feel of the institution? I wondered nostalgically. Where were the chain-link fences, the metal detectors? Bella, of course, is from the futuristic dystopia, where godless America has been forced to turn all their schools into prison-like structures with cinder-block walls, chain-link fences, metal detectors, and of course the trained pit bulls. 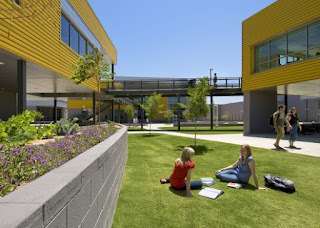 Since humans can, in fact, become accustomed to almost anything, Bella has naturally adjusted to the prison-like atmosphere of her school in Phoenix, and in fact misses the institutional feel of the impersonal building designed to "cage", as the students fondly say, the very essence of modern learning. This strange, populist place - no doubt staffed by Real Americans and Pluggers - without barbed wire and the constant surrounding threat of danger and death baffles her. How can a student be expected to learn when she isn't being frisked daily for the butter knife in her lunchbox that could no doubt be wielded as a weapon? 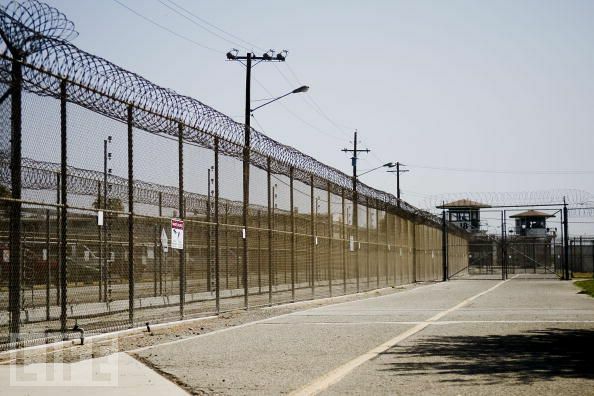 How can one be expected to focus on the curriculum without the comforting sight of chain-link fences lined with barbed wire keeping out the pedophiles that flock to the city in droves? And how on earth can anyone be expected to go to a school that features trees on the property, when everyone knows Phoenix is an unending desert as far as the eye can see? Whoops, that last one is actually a prison in California. But you'll have to admit the similarities are positively eerie. Forks High School had a frightening total of only three hundred and fifty-seven — now fifty-eight — students; there were more than seven hundred people in my junior class alone back home. All of the kids here had grown up together — their grandparents had been toddlers together. I would be the new girl from the big city, a curiosity, a freak. Most of you already know already that Bella is about to have the best first-day-of-school ever, and that she'll be accepted with nothing but kindness and polite interest both from the girls and the boys at her new school. Putting that aside for a moment, Bella's fears seem perfectly appropriate to me - but perhaps not for the right reasons. It's normal, of course, to be nervous before starting a new school - fears heap up about performance, impressions, and of the unknown. A bigger school can offer some insulation from those fears - if you don't make a good first impression with a given group of potential friends, you can probably find another group to fit in with - but Bella seems to be worried about the size of the school in and of itself. A Big City Girl with Big City Prejudices, Bella worries that she'll be ostracized as an "outsider" from the small community of Forks, possibly because of her cripplingly inability to play the banjo or some other stereotypical small-town faux pas. Of course, the fact that Bella won't be ostracized at her new school, but in fact will be completely accepted by the other girls and vehemently fought over by the boys of her class could be taken as yet another example of how the small town of Forks - with its homey schools, free from barbed wire and the fear of school violence - is superior in all its small-town glory to the cold, impersonal big city of Phoenix. 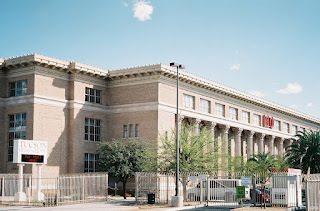 Indeed, that would seem to be the authorial intent, what with the ham-handed comparison to how much safer and nicer and generally earthy the Forks high school is over the harsh, frightening schools of Phoenix. However, if you don't want to subscribe to an attitude that small towns are automatically made of win, you could be completely uncharitable and assume that the plain, translucent-skinned, cripplingly-clumsy Bella will soon become the unchallenged belle of her school simply because all the boys are desperate to kiss someone who isn't related to them in some way or another. Chaparral High School is in Scottsdale. It's a minor quibble, but Scottsdale is a much richer area than Phoenix and the schools in Scottsdale look really impressive. 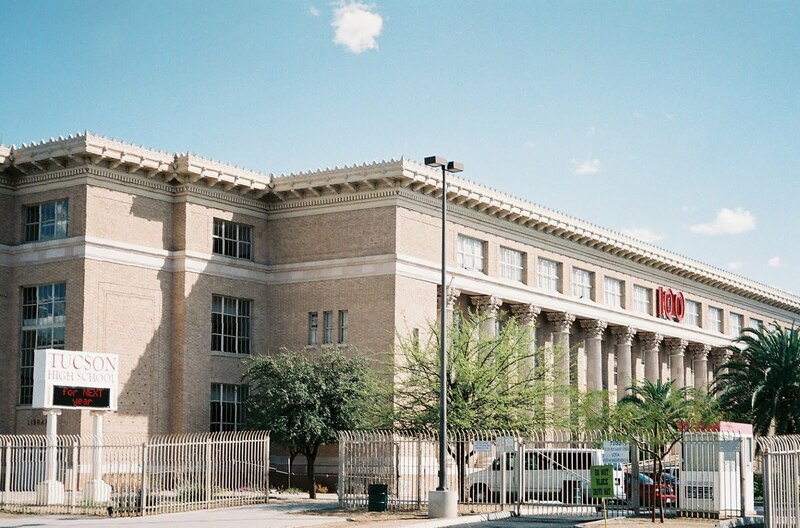 I attended high school in Scottsdale in the 90's (not at Chaparral) and elementary school at Phoenix (also in the 90's), and my elementary school really did look like a prison: there were no windows whatsoever. The building was entirely lit with florescent lighting. We didn't have metal detectors, but there was a high chain link fence (no barbed wire, however). 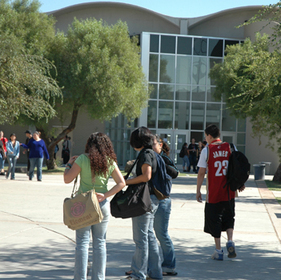 The high school I went to in Scottsdale did have metal detectors and a police presence on campus. While I was in attendance there, there was a kid who brought a gun to school (but he bragged about it to his friends, who told on him, so he was suspended), and one year, over a hundred kids were arrested on a single day for having drugs on campus. I was nearly suspended at one point for possession of a pair or scissors (which I did not use to harm another student). I also witnessed a student beaten to a bloody pulp with a baseball bat outside the library. He survived. There were about 6-7 deaths in the four years that I attended that school (illness, drugs, car accidents). 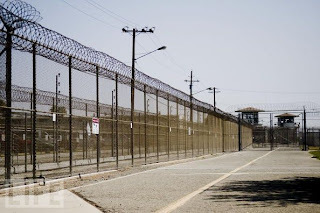 It did not look like a prison visually in the way that my elementary school did, but most of what Bella remembers from her school in Phoenix were present in a less obtrusive way in my high school. I felt at the time that the metal detectors and all the rest didn't offer any real safety, so unlike Bella, I wouldn't have been upset by the lack of them. Heck, I even figured out at the age of 13 or 14 the easiest way to maximise the casualties if I wanted to bomb the school (it's a good thing I didn't want to! ): we had scheduled bomb drills, always announced several days before hand, where we were required to all evacuate the building and go sit on the bleachers in the football field. Thus, any one with half a brain who wanted to kill a lot of people would have rigged those bleachers. I did the similar jump from a big city to a small town my first year of middle school. The town I went to had a population of less than 1000 at the time, and the entire K-12 school district--including staff--had just over 200 people. While I did make some friends, it gave me someone to sit with at lunch at not much else. I was never invited to parties or over to someones house for a sleepover or out to see a movie, or even just out to hang out. By the time I arrived, all my classmates had formed into their cliques with people they had been in class with for seven years. So, I can see the worry. My senior year of high school, I made the jump in reverse, and went from the tiny school back to the big city school. No metal detectors that I remember, but there was security presence on site and we did occasionally have bomb drills. I about had a heart attack going in my first day of classes. Bella's fears make sense to me. 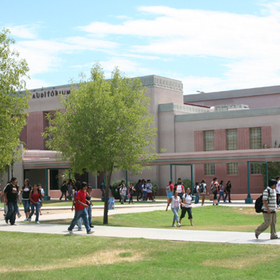 I was glad to get away from people that I'd been in school with since kindergarten, and when I had the chance to return to those schools I chose the school with the drug deals, the racial diversity (literally--25% of the population was a major racial group, e.g., Asian, African-American, Latino/a, and white), and the people who despised me because it would have been the same either way. But I could say I'd made the choice. Bella doesn't have a choice of schools in Forks.